When provided with adequate nutrients at a suitable temperature and pH, E. coli bacteria can double in number within 20 minutes. This is faster than most species grow, and faster than E. coli grows under natural conditions. Regardless of the rate, the growth of a bacterium involves synthesizing double the quantity of all its parts, including membrane, proteins, ribosomes, and DNA. Separation of daughter cells, called binary fission, is accomplished by creating a wall between the two halves. The new cells may eventually separate, or may remain joined. Scanning electron micrograph of bacteria in rod and cocci form. When environmental conditions are harsh, some species (including members of the genus Clostridium) can form a special resistive structure within themselves called an endospore. The endospore contains DNA, ribo-somes, and other structures needed for life, but is metabolically inactive. It has a protective outer coat and very low water content, which help it survive heating, freezing, radiation, and chemical attack. Endospores are known to have survived for several thousand years, and may be capable of surviving for much longer, possibly millions of years. When exposed to the right conditions (presence of warmth and nutrients), the endospore quickly undergoes conversion back into an active bacterial cell. 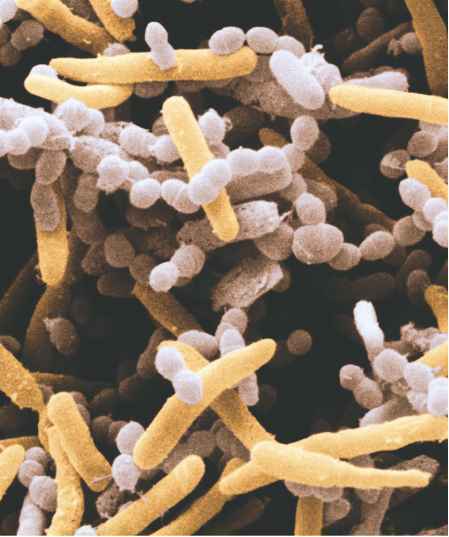 Most eubacteria have DNA that is present in a single large circular chromosome. In addition, there may be numerous much smaller circles, called plasmids. Plasmids usually carry one or a few genes. These often are for specialized functions, such as metabolism of a particular nutrient or antibiotic.